Want to keep a copy for your home or showroom? Download a PDF version of this article. We guide you through what to use, what to avoid, and how to clean your wood floors. Wood floors should last a lifetime with proper care, but many homeowners are confused when it comes to cleaning their floors. How do I clean my floor without damaging it? How often does my floor need to be cleaned? There are many products you can find at big box and supermarket stores that promise a clean floor but can leave a hazy residue over time and prevent you from being able to refinish them someday. Other products are too harsh to use on wood surfaces and can damage the finish. Nobody wants to walk on dirty, sticky or hazy wood floors! 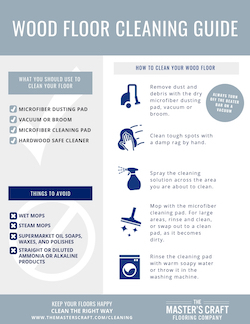 We’ve put together a straightforward guide to cleaning your wood floors the right way so you can rest assured that your home is clean and your wood floors are protected. What’s the difference between a microfiber dusting and cleaning pad? A dusting pad is designed to be used dry and swept across the floor to collect loose dirt, hair, crumbs, and other debris. Getting this stuff off your floor will make mopping much more effective. A microfiber cleaning pad should be used with a hardwood floor cleaning solution that is sprayed lightly across the floor and mopped with the cleaning pad. Remove dust and debris with the dry microfiber dusting pad, vacuum or broom. Clean tough spots with a damp rag by hand. Spray the cleaning solution across the area you are about to clean. 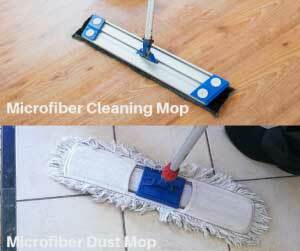 Mop with the microfiber cleaning pad (rinse and clean or swap out to a clean pad if it’s a large area you are cleaning). Rinse the cleaning pad with warm soapy water or throw it in the washing machine. 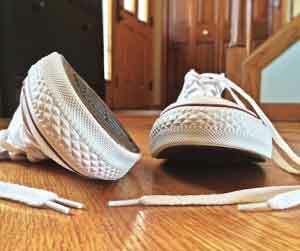 These simple steps are easy to do and will keep your floor looking great. It’s a good idea to sweep or mop the high traffic areas of your floor daily. A no-shoes rule helps too! Keep a copy handy to refer to when cleaning – download a PDF version of this article here. Wipe up spills right away with a rag or paper towels. Dry mopping, sweeping or vacuuming can be done daily as needed. High traffic areas usually need to be swept every day. Low traffic areas can be less frequent. Your main goal is removing dirt and debris that could damage your floor, or be hard to clean-up later. Spray and mop once per week, or more as needed. Kitchens, hallways, entryways and living areas need the most attention. Stains and grime will get harder to clean the longer you wait. Wet mops. They generally put too much water on your floors, which takes too long to evaporate. Water and wood don’t mix so avoid wet mopping with straight water. Steam mops. Steam mops will certainly get your floor clean, but the heat and high moisture will damage your floors over time. 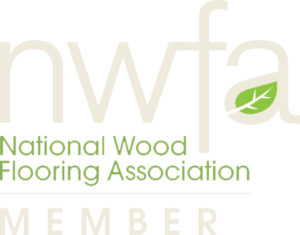 Most flooring manufacturers tell you that these will void the finish warranty on your floors! Supermarket oil soaps, waxes, or polishes. These wood floor oil soaps often say they are safe for wood and promise a shiny floor, but over time will leave a hazy residue. The buildup from these products can cause major problems if you ever want to refinish your wood floors. Avoid them for sure! Straight or diluted ammonia or alkaline products. 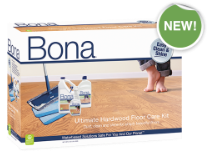 Ammonia is too harsh for wood floors – even if it’s been diluted – and is likely to damage the finish or cause it to appear dull over time. 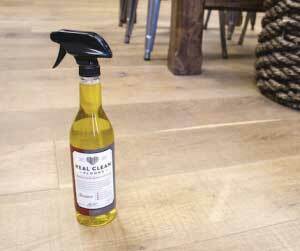 Real Clean Floors makes an excellent wood-floor-safe cleaner. We carry both of these products in stock at our 12 Midwest locations. Get a quote today. 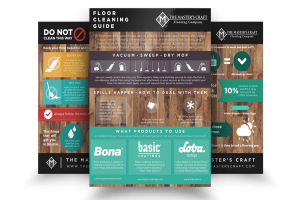 Download and share our guides to learn more about how to clean and maintain your wood floor. You you not recommend Murphy’s oil and water mix?  Vicki, in our experience Murphy’s oil can leave a hazy residue on your floors over time that can be nearly impossible to remove and can lead to contamination issues if you ever want to have your floors professionally recoated.